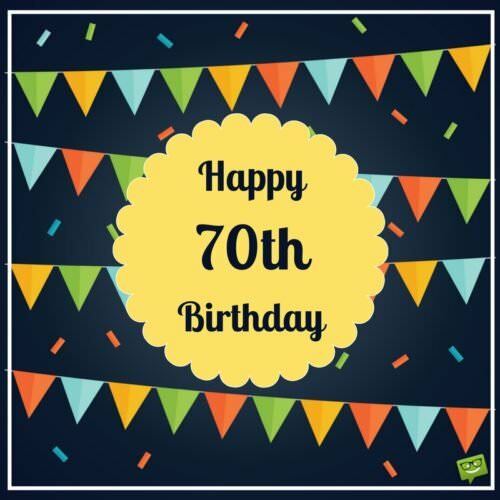 Considering what a major accomplishment turning 80 is, you should by no means let a family member’s 80th birthday go by without sending them a heartfelt message to let them know they’re on your mind. 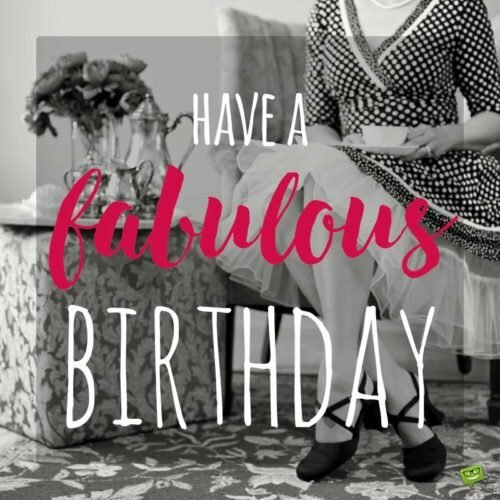 If you need warm birthday wishes to do this, the sweet lines we’ve provided below might just turn the trick! Happy 80th birthday, Dad. May God Himself come down and watch over you on this special occasion of your life. I love you so dearly. Dad, on this milestone birthday celebration of yours, I want to thank you for all the incredible sacrifices you’ve made in the advancement of my happiness in life. Happy 80th birthday. I feel privileged to not only be the son/daughter of a wonderful man like you, Dad, but also to be the recipient of your amazing love and support. Wishing you a truly spectacular 80th birthday and life. Dad, from the bottom of my heart, I wish you a truly joyful 80th birthday. Thanks for always being more than a father to me. 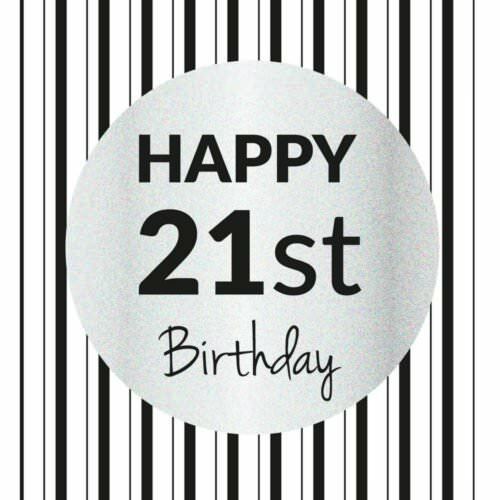 Wishing you all the wonderful treasures the heavens have to offer you as you celebrate this great day of your life. Happy 80th birthday! Thanks to an incredibly loving father like you, my life shines a thousand times brighter than a supernova. As you turn 80 today, I pray you’re blessed with nothing short of an awesome life filled with incredible joy. Mom, I hope that the angels of happiness visit you today and bless you with their presence for the remainder of the year. Wishing you a joyous 80th birthday. Today I’m reminded of how God has been kind to me by blessing my life with you. Happy 80th birthday, Mom. I’m so elated to celebrate your 80th birthday with you, Mom, and I hope I’m also fortunate enough to spend all the days of my life in the pleasantness of your company. Happy birthday. There is no one in my life I love more than you, sweet Mother. Happy 80th birthday! I won’t be happy today unless my dearest mother is, so Mom, let me know what activity we can engage in to bring joy to the both of us as you commemorate this special day of your life! 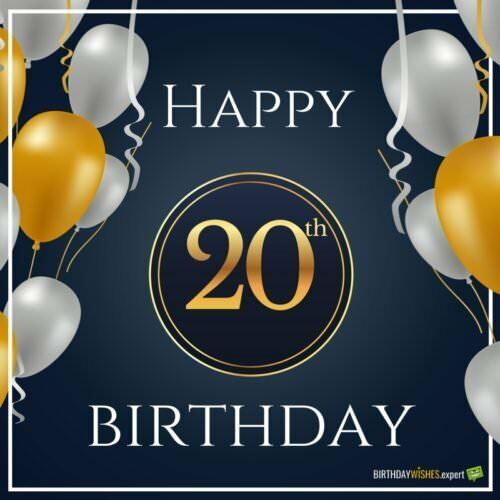 Happy 80th birthday! Mom, may God bless you so abundantly on your 80th birthday today so that happiness will always have many reasons to live in your loving heart. Happy birthday. You’ll forever be the recipient of the greatest honor in my heart. Happy 80th birthday, beloved Mom. Happy 80th birthday, Mother! May good health and real joy accompany you every step you take in life. I’m hoping that everlasting blessings of true happiness will be yours…today and forever. Happy 80th birthday, dear uncle! I hope that you’re able to get some rejuvenating relaxation and fun this beautiful day. Happy 80th birthday. Dear uncle, on your 80th birthday, celebrating, drinking and partying is on me because I would feel cheated if I weren’t able to spend this beautiful day with you. Happy birthday. I’ve decided to use the wonderful occasion of your 80th birthday to let you know what a wonderful uncle you have been to me my entire life. May God reward you tremendously for that. Happy birthday. I possess an unparalleled degree of happiness and pride because I have a great uncle like you in my life. Happy 80th birthday. Wishing you an absolutely happy 80th birthday, dear uncle! Today, I hope to have the opportunity to get a little tipsy with you and indulge in some relevant conversation. For an excellent 80th birthday. Happy 80th birthday, beloved aunt. I appreciate this special day because it reminds me of how lucky I am to be blessed with an amazingly loving and beautiful aunt like you. 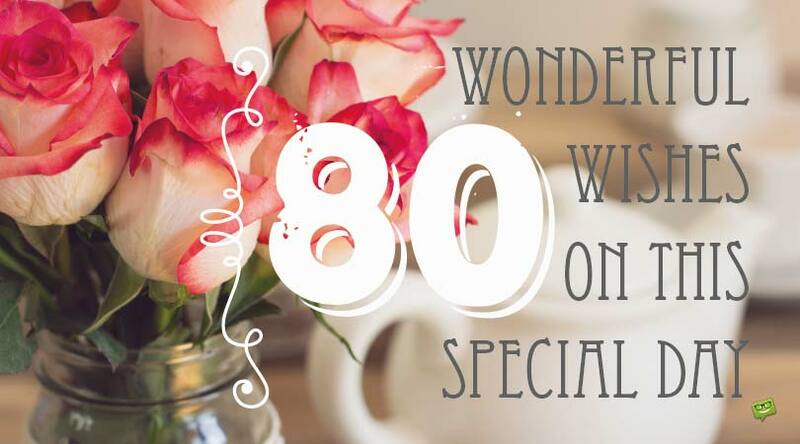 80 looks absolutely gorgeous on you! Hope your special day is as incredibly gorgeous as you are. Happy 80th birthday! May happiness spend quality time with you not only on your birthday but also on all the days of your extraordinarily beautiful life. Wishing you a very, very happy 80th birthday, dearest aunt! May every day of your life as an octogenarian be filled with good health, boundless happiness and immeasurable blessings. Wishing my amazing aunt an 80th birthday that is as glorious as the clear blue sky. Thank you for being such a special and irreplaceable part of my world. For bringing me more bliss than I ever dreamed of, may the heavens sprinkle blessings of everlasting happiness on you as you celebrate your 80th birthday. 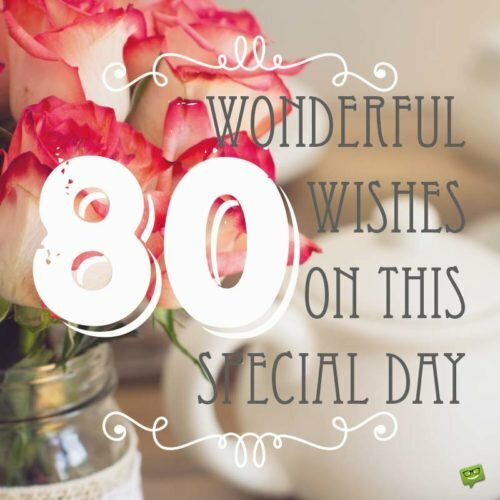 80 wonderful wishes on this special day. Hoping all the 24 hours of this milestone birthday of yours are as wonderful as you have been to the entire family. We love you so much, Grandma. Happy 80th birthday. On your 80th anniversary on earth, I’m going out to enjoy the best delicacies I can afford, but I know the whole experience would be a lot more delicious if you were there with you. Miss you so much, sweet Grandma. Happy birthday. Dear Grandma, you are the closest thing to an angel I ever met, and I would be honored to spend this great day of your life with you. Wishing you a fantastic and blessed 80th birthday. No matter how tough the journey of life gets, I always have ample of reasons to celebrate because I have the most phenomenal Grandma in the world. Happy 80th birthday, my precious Grandma. Happy 80th birthday, dearest Grandma. For me, it’s an absolute honor to call myself your granddaughter/grandson. Grandma, may God bless you with the key to unlimited happiness on your 80th birthday. Wishing my dearest Grandfather a fabulous 80th birthday celebration. I hope to meet you later in the day and enjoy a lovely dinner together. Grandpa, I hope that this special birthday of your fabulous life will bring you good healthy, plenty of cheer and a lot of great blessings. Happy 80th birthday. Happy 80th birthday. Never will I stop loving and appreciating your presence in my life, Grandpa. There are uncountable wonderful things to enjoy at age 80. I hope you’re able to take them all in! Happy 80th birthday. Grandpa, congratulations on making it to 80 in such grace. You’re such a remarkable inspiration to me. Happy birthday. Granddad, I have only one important wish for you as you mark 80 years of being a blessing to this world. Be forever happy and healthy! Happy 80th birthday! Hope you spend each day of your life in the company of true friends, family, and most importantly, true happiness.